The American South is mostly Slytherins, and the Midwest is largely Hufflepuffs. But whether or not you enjoy these comparisons or roll your eyes at them, a new study has shown that one surprising Harry Potter parallel has actual societal worth. It turns out that when you put Hogwarts house sorting data onto a map of the United States, placing users in their home state and comparing their assigned houses, people belonging to certain houses tend to live near each other IRL. That means that Florida is actually Slytherin as hell, the Midwest is dominated largely by Hufflepuffs, California is definitely Gryffindor, and Northeast states have a high number of Ravenclaws. So, how did this happen? A group of 'Harry Potter' cosplayers choose their houses at Otakuthon in 2013. Time and the Cambridge University Department of Psychology created a special kind of Sorting Hat quiz which divides the United States geographically. The results are drawn from 330,000 participants in order to determine the spread of cleverness, boldness, ambition, and loyalty across the country. You can take the quiz here and add to their data. Since Gyffindor’s primary quality is courage and boldness, it’s noteworthy that the “Gryffindor states” are places that were considered “the frontier” in America’s early years: California, Nevada, Alaska, Colorado. Maine, too, is associated with outdoor adventure, thanks to its rural environment. Washington and Montana are also half-Gryffindor. Daniel Radcliffe's costume from the 'Harry Potter' film series and also the official Hogwarts uniform of the American Midwest. Ravenclaws are known for their cleverness. Perhaps unsurprisingly, the Ravenclaw states are primarily places where many elite colleges and universities were established. In fact, every single state that hosts an Ivy League schools is primarily “Ravenclaw.” Intriguingly, so are Arizona and Wisconsin. Hufflepuff is associated with loyalty and valuing fairness. And playing directly into stereotypes about Midwestern friendliness, according to the map, the majority of the Midwest is comprised of Hufflepuffs. FOUNDER OF HOGWARTS: okay, so we all know there are four types of kid. brave, smart, evil and miscellaneous. It’s the final category that offers the biggest surprise. Contrary to popular belief, Slytherins are not evil. The primary quality is ambition, which is why it’s unsurprising that Washington D.C. is firmly Slytherin. 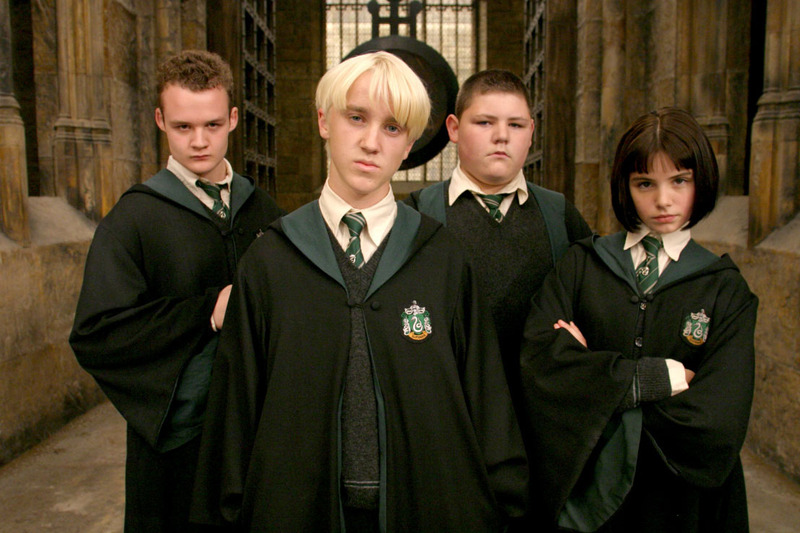 It’s more surprising that the South — including Texas and Florida — is filled with Slytherins. It’s also intriguing that Texas is not Gryffindor like California and Nevada, perhaps suggesting a “wild west” caricature or a “slower-paced friendly people” assumption is not the whole of it. Classifying people into four types is always a simplistic way to view human emotion. Even the Harry Potter books acknowledged that people have duality and that sorting is imperfect. The Gryffindor Hermione is frequently asked why she isn’t a Ravenclaw; the Hat is torn between sorting Harry into Slytherin or Gryffindor; the Gryffindor Neville mentions that he was nearly a Hufflepuff; and the Ravenclaw Luna Lovegood joins Gryffindors on a dangerous mission. Still, Florida is Slytherin. At the very least, that validates all the “Florida Man” jokes.